Without argument, most Vista users would have agreed that User Account Control (UAC) is the most annoying and irritating feature in Windows Vista. This security infrastructure gatekeeper keeps prompting you and requesting for permission for even small and simple safe tasks that you probably do daily. UAC aims to improve your Windows’ security system by limiting application software to standard user privileges until an administrator authorizes an increase in privilege level. Of course the easiest way to resolve this annoying alert is to turn UAC off. However, it probably puts your computer at much greater risk if you opt for this simple method. 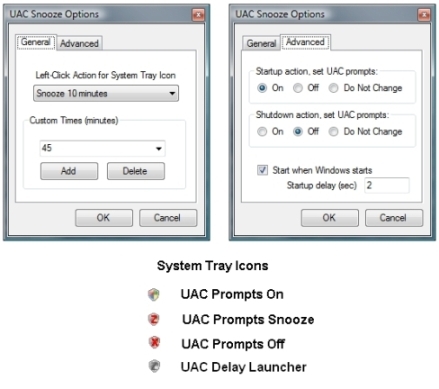 To rid you your dilemma, UAC Snooze offers you a more practical way: temporarily stop UAC when you don’t need it. UAC Snooze is a Windows Vista program that allows you to temporarily stop User Account Control (UAC) prompts from asking permission to do something by simply clicking on an icon in the system tray. This is done by leaving UAC on, but turning off the prompts (and automatically granting elevated privileges) for a user-defined amount of time, and then automatically turning the UAC prompts back on. This allows you to take advantage of the UAC security features most of the time, while temporarily turning off the prompts when you know they are not needed. UAC Snooze sits in your system tray. It is ever ready for you to turn on/off UAC easily. If you don’t want the annoying prompts from UAC to disturb you when you are doing something such as customizing your system, you can simply click on the UAC Snooze icon and activate the “snoozing” process. You can decide how long you want this application to stop the UAC feature, e.g. 1 minute, 5 minutes, 10 minutes, etc. UAC Snooze will leave you with peace of mind for the pre-defined amount of time before the UAC prompts come back again. UAC Snooze comes in both 32-bit and 64-bit flavors to suit your Vista version.